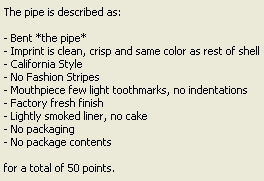 The value of pipe #745 is 50 points. Paul Seubert found this site and wrote to offer this pipe as a gift! I accepted his kind offer, but insisted that I pay at least the postage. So I now have this very nice addition to the Pipes for Sale or Trade. Steve McLean has recently started a collection of the pipe and bought this one to take with him on his deployment to Iraq.